You work your tail off to build traffic to your website. But what good is it if that traffic doesn’t turn into leads? A/B testing is usually the default testing methodology, but for sites with low-traffic and low-conversion rates, serial testing is a much more viable choice for conversion optimization. …and now you have to integrate conversion optimization into the mix? When will it end? Actually, conversion optimization is the beginning of many good things, as it can turn that traffic into leads and customers. But traditional conversion optimization tactics won’t work for every site. Conversion optimization is the process of systematically testing the points on your website where you ask visitors to take action. That action can include subscribing to a newsletter or clicking on a call to action button like the one below. This has typically been the domain of heavily trafficked websites that also get a high number of conversions. They use A/B testing, split-testing and multivariate testing. They test constantly, employing tactics used by experts like Joel Harvey and his team at Conversion Sciences. Why is conversion so important? 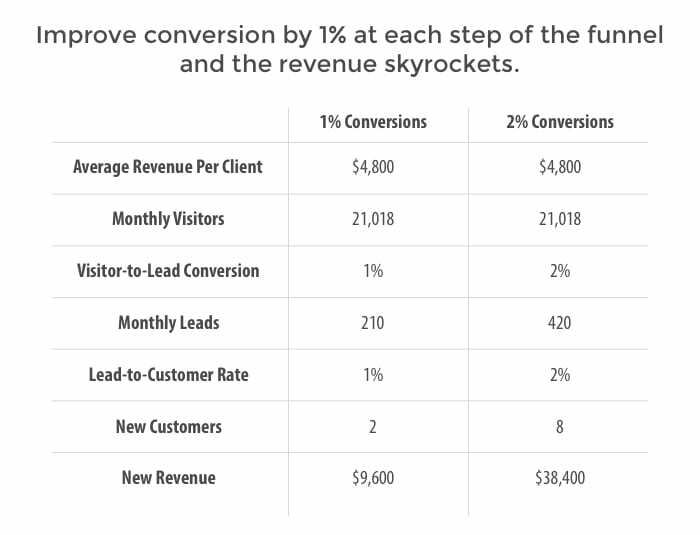 The chart below illustrates how your company can quadruple its revenue from web leads with only a 1% increase in conversion rate. Note how this hypothetical company’s monthly visitors and revenue per customer don’t change. But through conversion optimization, it gets a 1% bump in how many visitors become leads and in how many leads become new customers. A small change with powerful results. Most testing requires tools like Optimizely or Visual Website Optimizer. These can be complicated and time-consuming to learn and operate. If you are the marketing director behind a low-traffic, low-conversion website, you don’t need those tactics for your website. In fact, according to Joel, you shouldn’t use those tactics. You should use serial testing. With serial testing, you make a targeted, fundamental change to your website, and then let the “test” run for 2-6 weeks. If you have achieved a lift — or improvement in conversions — of over 25-30%, you can then allow the change to remain. It’s best to monitor it over time to ensure the conversion rate remains consistent. Serial testing is different from A/B testing because it involves a “fundamental” change (we’ll explain what that is shortly.) With A/B testing, website software provides every other visitor to the website with a different option. Visitor 1 gets option A, Visitor 2 gets option B.
A/B testing is designed to reduce the impact of variables on a test, such as seasonality or differing visitor sets. It’s ideal to improve a headline or a call to action button, but it really requires a high degree of conversions to be effective. And that gets to the heart of why serial testing is the ideal approach for low-traffic, low-conversion websites. A/B testing is all about incremental changes. Serial testing is about fundamental changes. And that’s because of the numbers. Why? Because your site doesn’t even have enough conversions to make A/B testing worthwhile. At such low conversion rates, you’d have to let the test run for months or years to get a statistically valid result. 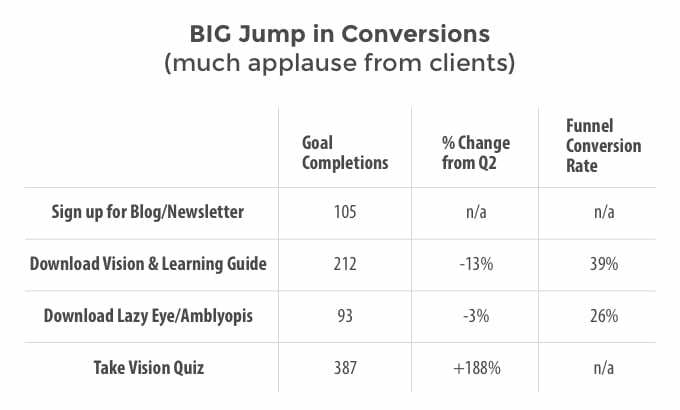 So you need to make a fundamental change to make those conversions happen in the first place. Remember, with serial testing, you’re looking for a lift of 25-30% or higher. Joel says those kind of increases are necessary because a 5% lift on a low-traffic, low-conversion website just won’t be statistically valid. You can put more faith in the sizable increases. What does an actual serial test look like in real life? Let’s take a look at one we initiated for a client. We discovered that the conversion rate for our client, The Vision Therapy Center, was low for some highly-trafficked blog posts. It was similar to the scenario Joel pointed out — high traffic, very low conversions. We made a fundamental change. We conducted a serial test in which we changed the offer. The call to action at the bottom of the web page previously revolved around downloading an informational guide on the relationship between vision and learning. We switched it to a call to action for “Take the Vision Quiz,” an interactive online test which helps evaluate symptoms of functional vision problems. We got the big lift Joel had been talking about. We saw a 188% increase from the previous quarter in conversions. This underscores the nature of serial testing. We didn’t have our offer right in the first place. As is the case with any type of conversion optimization testing, you need to be aware of potential pitfalls. Change in traffic composition: There is a chance the types of people visiting your page have changed significantly for your targeted test period. For example, a property management company that rents to college students and young professionals might see a surge in student visitors at a certain time of the year. You need to keep in mind who is visiting your site at a certain period of time, and adjust as best you can. Change in the marketplace: Joel points out that one of their clients experienced a drop in conversions right around the election, which may have been a source of traffic for visitors to their site. That’s why you can only bank on the big jumps in conversion. “If you’re seeing really large lifts, the chance in them being attributed to some unaccountable variable is smaller,” Joel said. It’s important that your Google Analytics is set up correctly to measure the goals to track the success (and failure) of your serial test. This set-up is important not only to watch the numbers for the short-term test, but also to keep track of the conversion rates over the long term. Joel notes that the longer the test runs, the more statistically valid your results will become. Be sure to segment out your reports based on unique visitors, as well as device type. Return visitors could skew your results, and people tend to interact differently with a website based on the device they’re using. You also need to be on the lookout for bogus traffic. If you see meaningful traffic coming from one IP address that has a 100% bounce rate, it’s likely a bot that’s crawling your site. That bogus traffic can affect your conversion rate, so adjust your filters accordingly. Serial testing is the best conversion optimization choice for websites that have a low-traffic, low-conversion rate. If your funnel has less than 300 to 400 conversions a month, you should consider this option. You are looking for big wins; anything less than a 25-30% lift in conversions runs the risk of not being statistically valid over time. You want to make fundamental changes to generate those types of lift, such as website page redesign; new information architecture; or a new offer. Your tests should run over a short period of time (2-6 weeks), so your results don’t become compromised by a change in visitor composition or changes in the marketplace. Your Google Analytics must be set up to monitor the goal, and you need to segment out reports based on unique visitors and types of devices. You also need to filter out for bogus traffic. If you have a website with low conversion rates (and typically low traffic) don’t be intimidated by conversion optimization. You don’t need expensive testing tools either. You just need to make the fundamental changes in the areas that need them most, and then track your results. 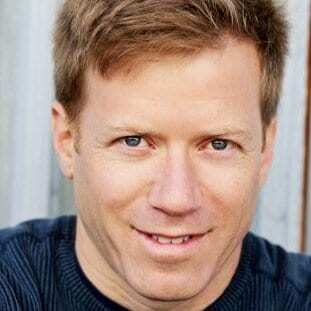 Greg Mischio is the Owner and Strategic Director of Winbound. The senior-level content writers and optimization experts at Winbound provide a unique, all-in-one content marketing and conversion optimization package specifically designed for small marketing departments. You can find Greg on LinkedIn and Twitter, @gregmischio. Fantastic info. I work with some small businesses- especially local- who just don’t generate much traffic. I agree… A/B testing is useless. It could take months for enough data collection.